Very fast with excellent versatility for your .22LR rifle, carbine, or pistol. 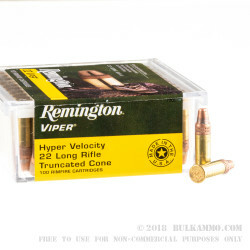 This is Remington’s version of the Hyper fast velocity .22 long rifle that will cycle in any of your toughest .22LR firearms and will keep the trajectory straight all the way past 125 yards. It will also get there in a hurry. 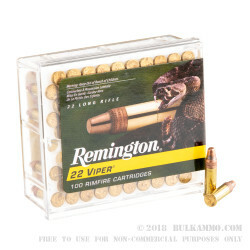 The accuracy is excellent for the money and whether you are plinking or shooting at legitimate targets, or even hunting with the round, this is the type of all-around performance you have come to expect from Remington and which will leave you ready for more adventures in the field or on the range. The speedy 1410 feet per second velocity and the 159 ft. lbs. of energy combine to give you a very potent small game load that utilizes a truncated cone solid bullet that sheds wind well, and maintains good trajectory over longer distances, as well as being effective enough to dispatch small game properly. 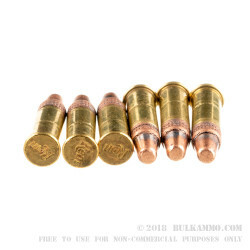 The copper cladding on the projectile (a 36 grain lead core bullet) is enough to mitigate most of the fouling concerns you might have in a bulk shooting session. 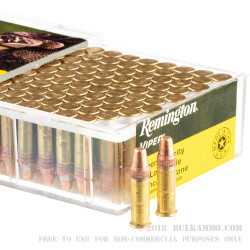 The appropriately sized 100 round boxes are priced a bit higher than most loads, but the cost is easily justified with the longer range, better overall trajectory arc at distances exceeding 75 yards and with the potent ballistic energy and velocity that will easily overcome most small game.